During the economic depression of the 1930s, many poor workers from the rural states of the Great Plains, especially from Oklahoma, moved away from their dusty home in order to seek their fortune on the west coast. They found work on the farms picking fruits in California. Although they brought not many things with them to the west, one thing for was for sure: their southern music came with them. One of those young men who left Oklahoma for California was Paul Westmoreland, born on September 19, 1916, in Oklahoma. During the time of the “Dust Bowl,” he moved to California and began working on the fruit fields and in armories during the Second World War. Westmoreland went back to Oklahoma several times but always found himself in a hopeless situation there, so he finally settled down in California. Already back then, he played music in order to earn a little extra money. After the war, he settled down in Sacramento, where he started his professional career as a musician and composer. In 1946, he had an own radio spot on a local station and was soon known as “Okie Paul.” “Okie” was a common insulting name for the many migrants from Oklahoma in those days but Westmoreland bore this nickname with pride. After every advertisement, he yelled out in the microphone “Tell ‘em, Okie Paul sends ya, heah!” That same year, Westmoreland composed his biggest success as a songwriter. “Detour (There’s a Muddy Road Ahead)” became one of the most successful country songs of the year and was recorded by countless artists. Elton Britt (RCA Victor) and Wesley Tuttle (Capitol) brought their version into the top 10 charts but the most popular version to this day was recorded by Spade Cooley and his Western Swing Orchestra. His rendition on OKeh sold even better than Britt’s and Tuttle’s version and it remained one of Cooley’s biggest hits. Patti Page covered it in 1951 and her version spent 16 weeks on the charts, peaking at #5. Possibly from the royalty payments, Westmoreland set up his own record label, San Antonio Records. “Devoted exclusively to the finest American Folk Music” was printed on the labels of San Antonio records and in fact, it appears they were excellent pieces in the field of western swing. Frankie Marvin, who had been a solid entertainer and experienced recording artist from the 1920s onwards, cut a couple of songs for San Antonio as well as Larry Bryant. Westmoreland also released his own recorded work on San Antonio. 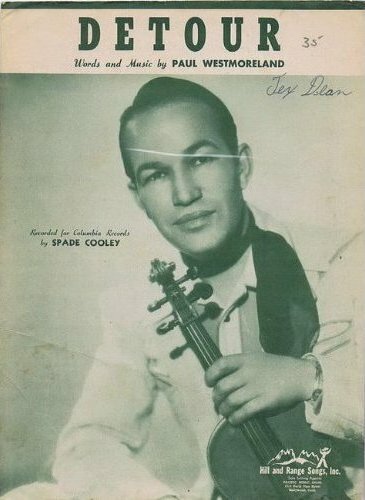 Most of them were written by him and show similarities to “Detour.” “Headin’ Down the Wrong Highway,” penned by Ted Daffan, and “From Now On” had the same topic as Westmoreland’s hit composition, while “Oklahoma Bound” was clearly a biographical song. By 1954, Westmoreland was recording for 4 Star out of Pasadena and laid down a solid pre-Rockabilly performance with his composition “Hot Rod Rag.” Recorded approximately in late 1953 or early 1954, it featured some hot licks by both lead and steel guitar. A poster from the 1950s announcing a “Rock’N’Roll Show starring Paul Westmoreland plus Max Houston’s Rocking Kings” suggests that he stuck with that style, at least for some time. He eventually would also record for K-Ark and Pride. 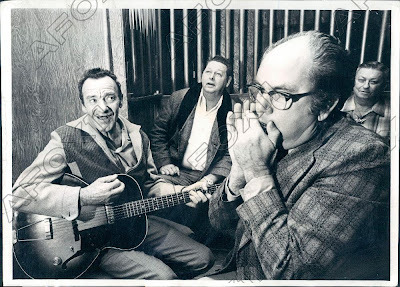 Paul Westmoreland and his band on February 28, 1973, at the Detour Inn during an "Oky-style session." Westmoreland is in front playing harmonica with (from left) Ernest McDaniel, Bob Carroll Pannini, and Griffie Lucac. He was married to a very interesting lady by the name of Ola Louise who envisioned herself as the next Loretta Lynn. Paul idolized her and a rule was that every band that played at the Detour would let Ola sing a set with them. I spent a lot of time in the Detour when I was stationed at McClellan AFB ... exactly one mile out the back gate to the bar. All of Paul's bartenders and bouncers at the time were from my squadron ... but don't let Ola catch you comping a drink to a friend! Big thing you had to watch out for was when a biker would start a fight ... don't worry about the bikers ...Watch out for Ola Louise! She'd be the first one to hoist a bar stool and come out swinging ... quite a sight! Eventually, the bar was renamed "Country Comfort" and closed its doors finally in 1992. The original building is still standing. Westmoreland's son Dave also became a musician. Paul Westmoreland died on June 21, 2005, in California. Slight correction, Okie's bar, The Detour Inn, was located on Raley Blvd. in north Sacramento. He was married to a very interesting lady by the name of Ola Louise who envisioned herself as the next Loretta Lynn. Paul idolized her and a rule was that every band that played at the Detour would let Ola sing a set with them. Funny thing though, all the time I spent in the place ... Paul never did sing once. Yes, I know that place. About the bikers, they are frienly. You can go. This played during summers in the late 1960s. OK, you sign as Anonymous ... but are you really the waitress we called Boots?